You are made up of 3 parts; your body, your soul (mind & emotions) and your spirit. The spirit part of you is the part that gets saved. It’s the part that completely becomes brand new when you get born again. In this Bible verse, it actually says that your spirit is now perfect. This is not because you live holy enough or are perfect in your actions. 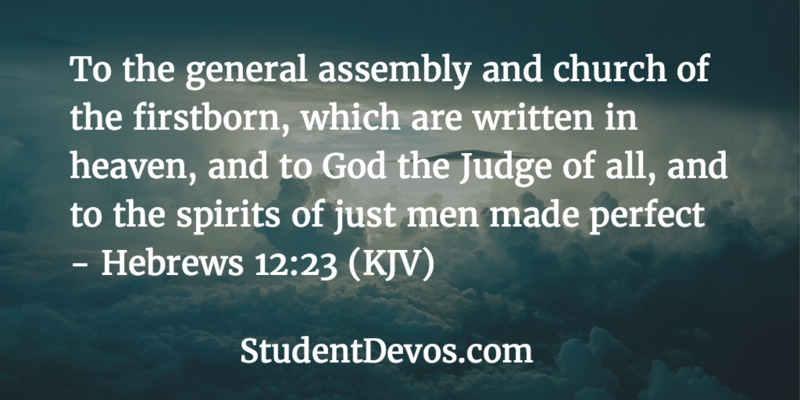 This means that Jesus’ spirit and your spirit are now one and your spirit is now made perfect. It’s mind-boggling think that you can be perfect. However, this is not talking about your body or your soul (mind & emotions). These parts of you are not born again. It’s your spirit that is. All of what the New Testament promises about salvation refers to what happened to your spirit when you were born again. Knowing that your spirit has been made perfect, gives you boldness and confidence to approach God and to reach out and help others. It’s hard to step out in faith when you think you’re not saved or have been made perfect with God. Today be bold in loving God and others knowing that the part of you that was born again; your spirit has been made perfect through the blood of Jesus.